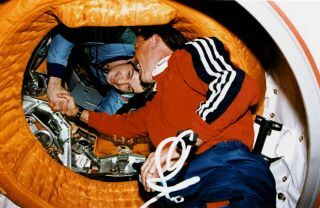 Astronaut Robert Gibson of STS-71 shakes hands with Cosmonaut Vladimir Dezhurov of Mir-18 in June of 1995. In this historical photo from the U.S. space agency, Astronaut Robert L. Gibson, STS-71 mission commander, shakes the hand of cosmonaut Vladimir N. Dezhurov, Mir-18 commander. The historic handshake took place on June 29, 1995, two and a half weeks prior to the 20th anniversary of a similar in-space greeting between cosmonauts and astronauts participating in the Apollo-Soyuz Test Project (ASTP). On July 17, 1975, astronaut Thomas P. Stafford, NASA's ASTP commander, greeted his counterpart, Aleksey A. Leonov, in a docking tunnel linking the Soyuz and Apollo spacecraft.